Education: After graduating from high school, she tried college for a month, only to conclude that was not for her. 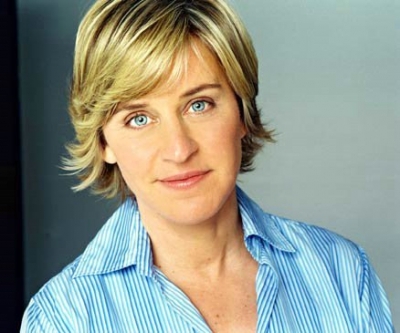 Acting Career: Started doing stand-up comedy, doing her own sitcom "Ellen". And has hosted the Emmys and Grammies. Since 2003 she hosts her own TV-show "The Ellen DeGeneres talkshow" (TEDS). Ellen is married with Arrested Development and former Ally McBeal star Portia de Rossi since 16. August 2008. After being employed as runner in a law firm, her career began as comedienne. In her first appearance, she didn''t do much more, than to consume a Whopper and french fries. In 1981, she was nominated the Funniest person in America. She later received The American Comedy Award an Award for the Cable ACE, and has also been nominated three times for an Emmy. The biggest honor she has earned, was for the funny commercials for fruit juices, " What''s that walker doing in there? Grandma ?". She regularly is a guest with David Letterman, Jay Leno and other Late shows host. After being last years Masters of Ceremonies of the Emmy-Awards she was nominated for an Emmy.